Canon launches two new firmwares (surprisingly, both hold the same version number v1.0.8, but they are really two different firmwares split at birth for two different cameras). For the Canon EOS 1D Mk-IV, this is the correction of a bug around the aperture management in video mode. 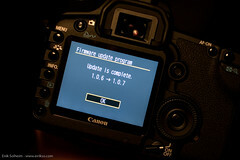 For the Canon EOS 550D, menus have to be corrected/updated.